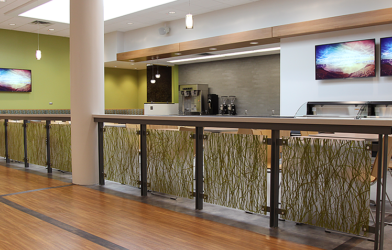 Raleigh Design Associates is a commercial interior design firm specializing in Healthcare, Corporate, Education, and Faith-Based design. 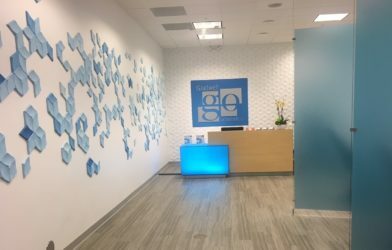 We work with our clients to create distinguished environments that promote wellness, empower collaboration, and performance, as well as elevate our clients’ brands. Whether planning a new professional space or freshening up an existing office setting, we work closely with our clients and listen carefully to their specific needs. Our involvement often begins during the planning stage, when your space is still a vision. 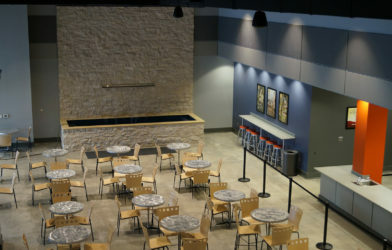 Raleigh Design Associates takes pride in collaborating with clients, listening to their needs, and creating high quality, functional, and unique environments they love and are proud to share with others. Our experience and established relationships with manufacturers give us the expertise to provide you with quality products that complete your space. 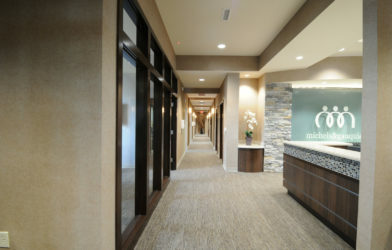 We are absolutely thrilled with the interior design outcome of our beautiful new veterinary hospital!! Pam and her team at Raleigh Design Associates were exceptionally helpful, professional, and fantastic to work with!! I was so overwhelmed with the thought of choosing all the finishes for our building and they truly made the entire process easy and fun! I knew what I wanted my building to look like, but being able to pull it all together to turn our perfectly was where Pam shines. She listened to me and made it her mission to deeply understand who I was and what I was trying to accomplish with the look and feel of the design. On top of keeping us on schedule and providing us with just the right amount of options, her ability and care to work within a set budget was greatly appreciated. If you are looking for an awesome interior design team who is so kind, fun, lovely in every way and provides help with everything from paint colors, tile, light fixtures, decorations, furniture and everything in between Raleigh Design Associates is your best choice. Our experience was everything we could have hoped for and so much more!! Let their work speak for itself...come visit us at Harmony Animal Hospital in Apex anytime for a tour of our beautifully designed building! Pam Williams of Raleigh Design Associates is a talented, organized and innovative designer! In 2015, we embarked on a wide scale renovation of our church facility and Pam helped us every step of the way. In the early stages, her expertise was invaluable as she guided us with everything from the concept to design. Her presentations were organized and thorough and she was patient and knowledgeable, thoroughly answering all of our questions. After one of the furniture distributors made a mistake in their design, Pam discovered the issue right away and fought for us to make it right at no additional cost. In 2016, we began a new phase of our remodel in our next gen area and we knew that Pam was the perfect designer for the job! She helped in creative ways to make our exciting space exciting and fun! Pam is a delight to work with and her professionalism is evident every step of the way. Thanks to Pam our space is beautiful, warm and inviting. Apex Baptist Church highly recommends Pam Williams for any project, big or small. We are so thankful for the privilege to work with her and we will be sure to work with her again in the future. Pam worked with us on the build-out of our two offices in Raleigh, NC, our 2,000 sq.ft original location in 2008 and our 6,000 sq.ft expansion in 2011. Then in 2012, she managed the creation of a new 6,000 sq.ft headquarters in San Diego, CA. All three are great and Pam was invaluable in guiding us through the process of developing great working environments from the empty spaces with which we started. From the planning phase through to completion, Pam brought us new ideas, critiqued our own proposals, and provided the attention to detail required for the success of the projects. We are all very happy with the outcome and regularly receive compliments from visitors to our offices. It is clear that Pam takes personal interest and pride in her work and I would highly recommend her for whatever endeavor you plan to undertake. You will not be disappointed. 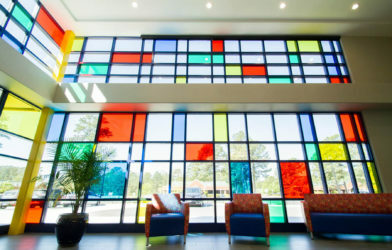 I have dealt with Pam Williams of Raleigh Design Associates since 2012, during which time she has provided Vidant Medical Center with excellent support in the areas of interior design, and project planning. Her work has been a major factor in the successful delivery of numerous projects. Her skills in design are exceptional, and her ability to successfully lead projects is outstanding. I can confidently recommend Raleigh Design Associates as outstanding and true professionals in their field. We have been utilizing Raleigh Design Associates for the majority of our Interior Design services for the past decade. Pam has proven her capabilities with a multitude of our clients and can work within the budget of our most cost conscious clients as well as more lavish designs. At this point in time, Raleigh Design Associates is working with us on finishes for a Cardiologist facility and with another client on the finishes for a 44,000 sq. ft. three story Medical Facility for the Brody School of Medicine. In our business, time is money and Raleigh Design Associates has always been extremely responsive to us and all of our clients regarding their interior design needs. Raleigh Design Associates is our preferred provider for Interior Design services.